We've said before, and no doubt we'll say again: transformation means more than fixing websites. It goes deeper than that, right into the organisations behind the websites. There's a logic to it: digital service design means designing the whole service, not just the digital bits. If you're redesigning a service, you need to think about the organisation that runs it. This is the hidden side of transformation. It's not so easy to see, because there isn't always something obvious you can point to and say: "That's transformation right there." That's partly why I took a train to Swansea a couple of weeks ago, to visit our colleagues at the Driver and Vehicle Licensing Agency (DVLA). You can see the deeper transformation happening there. I was accompanied by Iain Patterson, CTO at DVLA; Mark Evans, Chief Architect; Sally Meecham, Transformation Lead from GDS; Alan Morgans, Transformation Manager; Magnus Falk, Deputy Chief Technology Officer for Government; and Dafydd Vaughan, Technical Architect. DVLA's headquarters on the edge of Swansea is enormous. Everyone remarks on it when they first visit. I did. It looks a bit like a university campus. It was built to process enormous quantities of paperwork - because of course, that's how things used to be done. But things are changing now. Paper's not dead, but it's being phased out. We've already said goodbye to the tax disc. First we looked at the 3 DVLA exemplar projects: View Driving Licence, Personalised Registrations, and Vehicle management. The first of those went live back in October, so our focus was on the other two, which will shortly move into public beta after some time in private beta testing. Service manager Rohan Gye and his team did an impressively short demo - here’s what they showed me. Many people will recognise this piece of paper. It’s the V5C form, aka vehicle log book. You use different bits of it for different things when buying and selling a car. In total, there are 18 million vehicle management transactions every year, including changes of address, private sales, and buying from or selling to the trade. The last of those - selling to the trade - accounts for about 5.5 million transactions per year1. 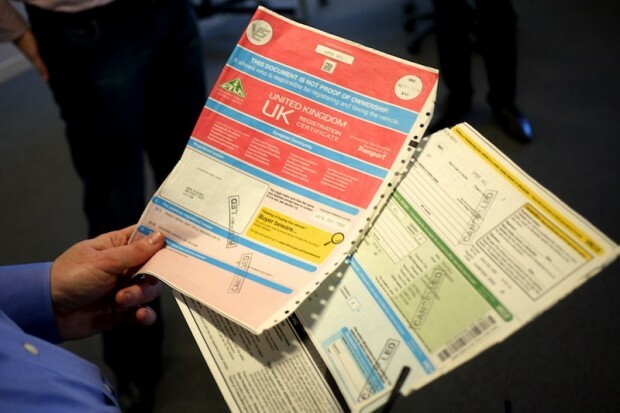 So even if the new digital service gets just 20% take-up, that will mean one million fewer pieces of paper sent to the DVLA. Seven out of 10 car sales are made to motor traders, often when owners do part exchange deals on newer models. Most of those sellers leave the V5C with the traders too, expecting them to handle the transfer-of-ownership paperwork. Here’s the beta service for selling a vehicle to motor traders. It’s very simple. It’s aimed at the traders themselves, since they’re the ones who usually do this task on behalf of their clients. The first step is to identify the business - so the first step is to enter a trading name and postcode. A location service from Ordnance Survey looks up the address (or users can enter it manually if they prefer). Once that’s done, they’re asked to enter the details of the vehicle being sold. They need the registration number and the latest V5C document reference number. Most traders will know where to find this number without even thinking, but just in case the service is being used by someone who’s not familiar with the paperwork, there’s a little graphic on this page, showing you exactly where to look for it. That’s a nice touch. The third step is to confirm the details. 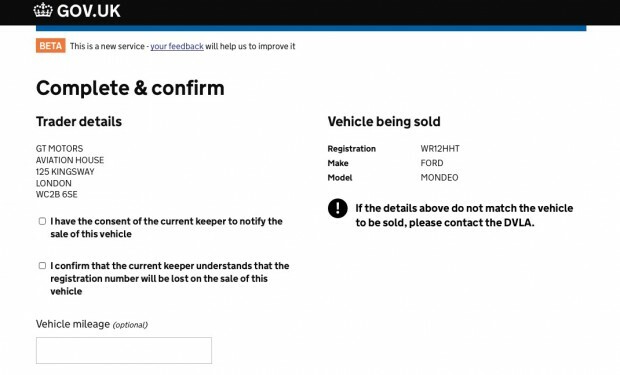 All the trader has to do now is tick a couple of boxes to confirm that the current official keeper gives their consent and approves the sale, pick a date, and optionally enter the milage of the vehicle. Then they click “Confirm sale” and it’s done. Finally, the trader is shown a summary page, which they’re asked to print out and send to their customer. There’s even a “Print” button to make that easier. Another button says “Sell another vehicle”. If the trader clicks this one, they’ll go back to step 2. They won’t have to enter their identifying details again, because the service remembers them automatically. So if they’ve had a busy day of buying and selling, they can sit down during a quieter moment towards the end of the day and go through all the changed ownerships in one go. 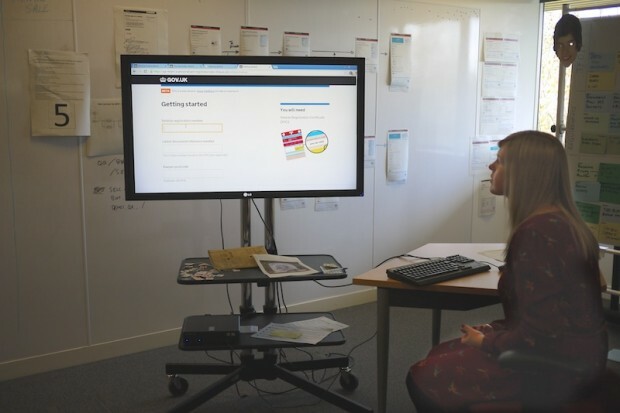 User research has shown that most users don’t need much in the way of assisted digital support, although some have found some help useful the first time they tried using the service. The team is setting up a helpdesk to answer user questions, and they will continue to test this approach as the beta phase continues. There’s so much to admire here. It’s a beautifully simple digital service that will save traders hours of time. 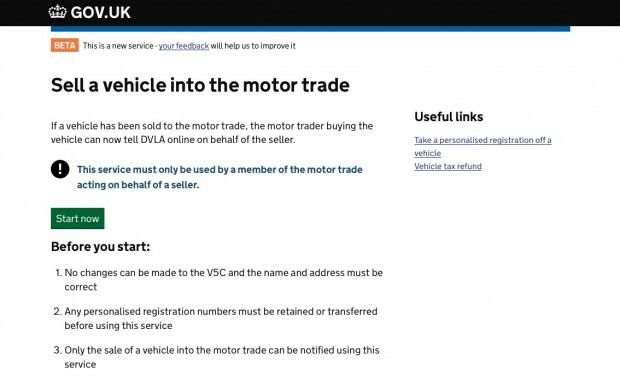 What’s more, the changes recorded here will be updated on the DVLA’s database in real time. The turnaround is instant. That matters because the law says you’re entitled to a refund on vehicle tax you’ve paid in advance for a specific vehicle. So the refund can be on its way much faster than it was before - which is good news for everyone. Now let’s take a look at another service that’s in beta. There are about 1.6 million personalised registration transactions per year, of which about 240,000 deal with retaining a registration2. This beta service is called “Take a registration number off a vehicle”. In the spirit of “Show the thing”, the name tells you everything: this is the service you use when you want to retain a personalised registration, probably so that you can put it on a new vehicle. Anyone who owns a personalised registration will understand why. The registration often means more - and sometimes, is worth more - than the car it’s attached to. When they want to sell their car, owners often want to keep the registration and transfer it to another vehicle. That’s where this service comes in. Again, the beta is aimed at motor traders, simply because they tend to do a lot more of the admin and paperwork than the rest of us. They will often be taking ownership of the vehicle that’s having the personalised registration removed, so part of their work involves arranging for that vehicle to be assigned a normal registration and giving it a new number plate. Otherwise they won’t be able to sell it on again. The first step is to enter the registration, the latest V5C reference, and the keeper’s postcode. The user is asked if they are the registered keeper, or if they represent a business that has consent to act on the keeper’s behalf - most of the time, traders will be choosing this option. 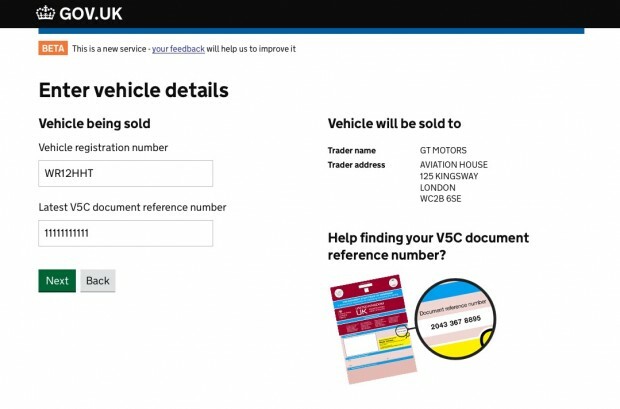 Again, the trader is asked to identify themselves and their business, and again DVLA is using the same Ordnance Survey address look-up system behind the scenes. The same tool, used for the same job, but in two different services. In the old days something like this would have been procured twice, probably at great expense. Now it’s a much cheaper off-the-shelf purchase from the Digital Marketplace. Next, the details are displayed back, so the user has a chance to check them. Notice how the registration is displayed to look like the number plate you’d see on a car. It’s a small, simple thing but it really helps to make the information more readable. 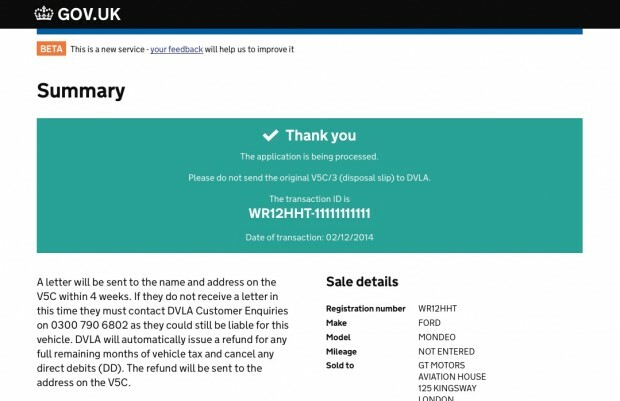 The trader gets a confirmation, and - instantly - a replacement registration to fix on the vehicle once the personalised one has been removed. 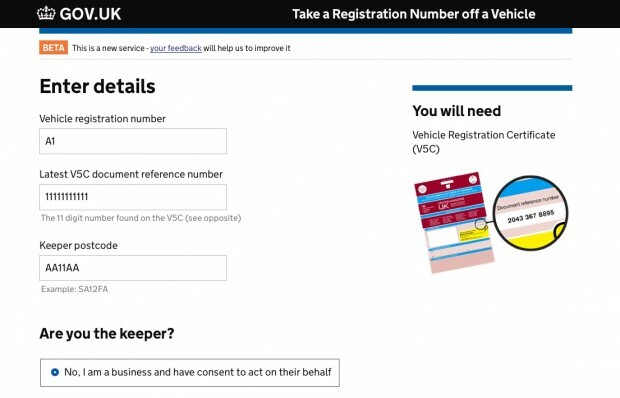 On the final page, they’re given the reference number they need for the transaction, and they can immediately assign the personalised registration to a new vehicle. Every single one of these steps has been designed to meet a specific user need. Lots of the tiny changes and design tweaks are there because research showed they would help users. The address look-ups, the number plates that look like real number plates, the little graphics to remind you where to find the right reference numbers on the right forms - all of it results from user research and constant iteration. Service designer Louise Pierpoint told me: “The trade have been calling for something like this for years.” I bet they have. Louise (pictured doing the demo at the top of this post) and her colleagues have been meeting motor traders - some of them small family businesses, some of them huge corporates trading in whole fleets of cars - to get their input on this service. It’s always a good sign when service demos are over in a few minutes, as these two were. It shows that the development team have been doing the hard work to make it simple. There’s not much to see because the complexity has been stripped away. That’s how we build services now. Again, there’s some telephone support in place to provide help to those users who need it. For both services, there are plans to make walk-through videos to help first time users, and the team is exploring the feasibility of web chat support. Both of these services are terrific achievements. They both reduce a 3 week paper process down to a couple of minutes. Both are expected to go into public beta early in the New Year. I think they’re going to make a lot of motor traders very happy. Later during my visit, I met DVLA's chief executive Oliver Morley and he was just as excited: "This is going to change the industry," he said. He's right. This bit - the organisational change bit - of transformation is much, much harder than the websites bit. People have a natural, and entirely understandable, resistance to change. No-one likes it, especially when they feel it's being done to them. But it can be done, and DVLA are doing it. For example: there's a new focus on services, and on service design. That means hiring or appointing service managers, re-organising teams, training and hiring people to make sure the right skills are there. 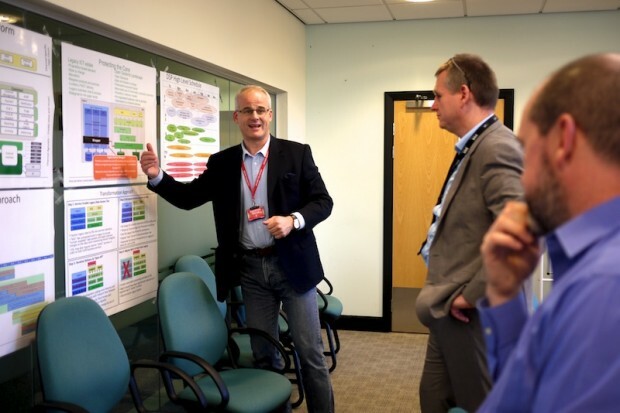 I sat in on one of DVLA's regular "Show and share" sessions, and listened to Transformation Manager Steve Railton talking about what this means for people. As well as service managers, DVLA is appointing capability managers tasked with finding people with the right skills. Many of them will already work in the organisation. Some will need to be hired. He talked about procurement - right now, DVLA procures everything on a project-by-project basis. That means it's hard to re-allocate funding or resources when circumstances change. Perhaps, he suggested, it would be better if DVLA procured at the portfolio level? Then project teams could dip into a larger pot of shared resources and just use what they need, when they need it. DVLA's technology is complicated. It's been built up over decades, with each new layer of technology laid on top of the layers below, like geological strata. 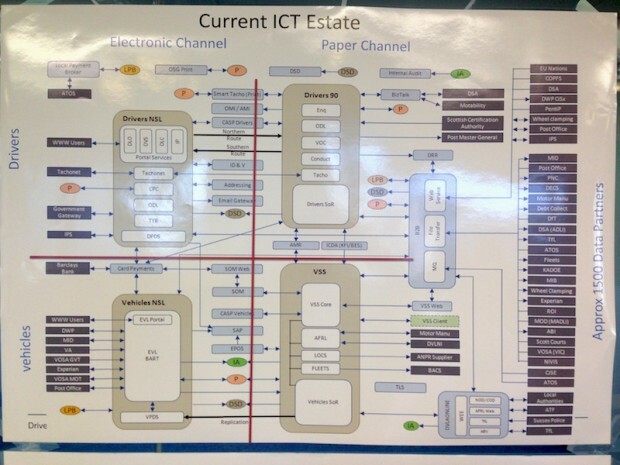 These systems have their origins in the paper based world, embodying processes, rules and data constructs which were relevant when records were held on paper and stored in filing cabinets ... It's very clear that these systems will not act as the platform we need as the DVLA offers more and more services as digital by default. It works, yes - but it's inefficient, slow, and much more expensive that it needs to be. Mark told Magnus and I that, at the moment, 77% of the money they spend on IT is spent just to maintain this behemoth of legacy technology. They're spending three quarters of the budget just to stand still. This diagram doesn’t cover everything that the previous one did, but you get the idea: it’s much simpler, and the whole system is designed to be interconnected. It's made of lots of small pieces, each one "channel agnostic", each one re-useable. Data flows between them via APIs. In short, "it's made of lots of small, logical pluggable components," in the words of Iain Patterson. It's not the kind of change you can do overnight, so instead they're doing it slowly, piece by piece. As newer systems are activated, the older ones will be gradually decommissioned. Eventually, they'll reach a tipping point where there's more new stuff than old stuff. That's when momentum takes over, and change starts to speed up. DVLA are doing some terrific work right now. 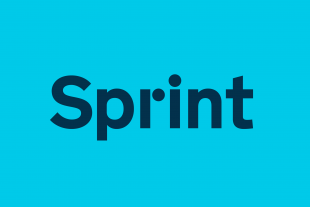 They're fixing websites, they're fixing the technology behind the scenes, and they're re-arranging the whole organisation around a new approach to user-centric service design. If that doesn't define "transformation", I don't know what does. I'm hugely impressed with what they're doing, and all I can say - all I did say when I was there - is "Well done." 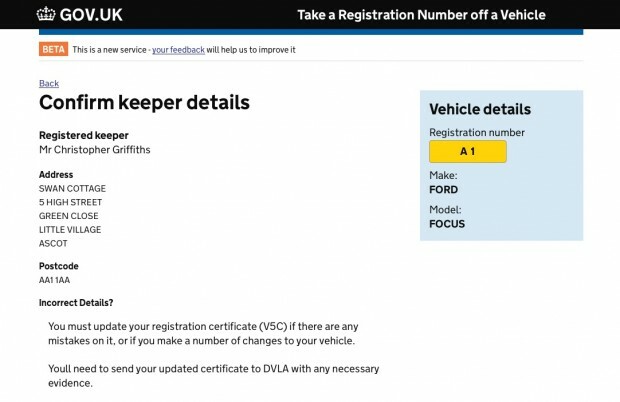 DVLA is a poster child for modern digital government. Let me end with this: when I started working in government back in 2011, people warned me to stay away from certain things. "You can't change DVLA," I was told. Not true, it turns out: they’re doing it themselves. "There's no skills - you can't hire developers around Swansea," I was told. Wrong again, yes you can: there are plenty of skilled people in south Wales, and they’ll be even easier to find now that DVLA has begun to set up closer links with universities in south Wales, and invested in the TechHub centre in the centre of Swansea. This is what it all comes down to: people and skills. The Civil Service is changing, and we need to bring back the skills that we outsourced in recent decades. Designers, developers, user researchers, service managers, all of these and more. 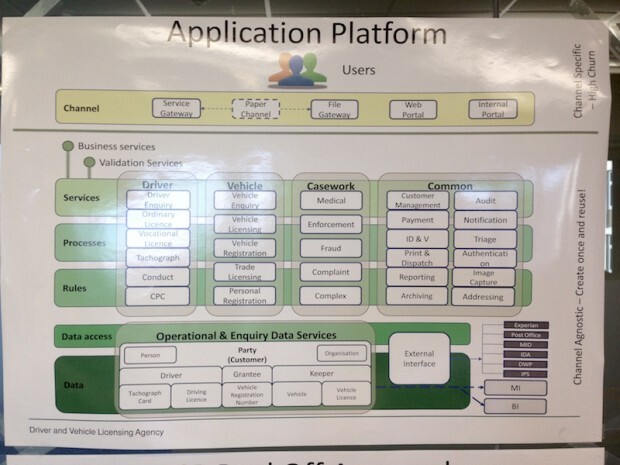 Come one, come all - come to Swansea, and help DVLA build modern user-centered digital services. 1 and 2 - Figures from the Performance Platform. Proof of the pudding is in the eating. Been waiting 5 weeks now for my V5C. The DVLA cashed my cheque 3 weeks ago. I can't tax the car, so I can't use the car. Have read plenty of similar reports from other frustrated customers. There’s still a long way to go when you are on the receiving end of the service! The future of the DVLA is Digital, and now couldn't be a better time to address this. The DVLA has been stuck in the past for far too long, these changes will make our services efficient, easy to manage and accessible to everyone. This is music to my ears, it's about time DVLA is brought kicking and screaming into the 21st century, I have been in the motor trade for over twenty years and always found Dvla frustrating and slow, although these changes are welcomed and obviously aimed at the big dealerships, auction houses and fleet businesses, I am a little concerned about the sole traders like myself. Will we have the same access as the big guys, or will we still have to use snail mail ? This is a very useful case study, and one that I shall certainly cite when encouraging organisations to take a root-and-branch approach to service transformation. It is not uncommon to encounter a presumption that going digital simply means having a good website and a bit of social media engagement. Organisational transformation, to embed digital into all aspects of service delivery, tends to be overlooked! Going digital is a major cultural change in the way that affects all services, and those delivering them, from the highest echelons of management to front line. The disruption will be major and of significant size. If an organisation can grasp and then address this principal, transformation of individual services will be easier to instigate.